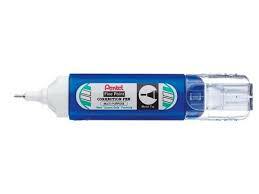 Or any fine point, felt tipped "marker pen". Trust me on this and ditch your pencil. You're going to be using and abusing the pages of your notes over and over, and if you want it still to be legible after the 10th time going over them before your exam, you'll want these marker-pens. At least the black one. If you're as much of a visual learner as I am, the multicolored pack is especially handy for drawing out those diagrams needed to make complex processes make sense. Krebs cycle anyone? This is basically a given with the fine point marker pens. Not to say you'll be making lots of mistakes, but you'll be making lots of mistakes. 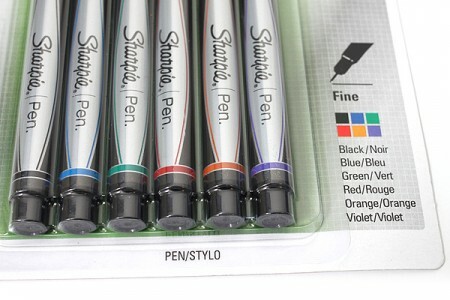 Any type will do, my personal preference is the "correction pen" variety. 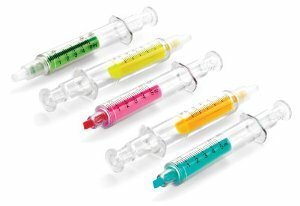 I'm not sure how practical these syringe highlighters are, but they are pretty nifty. Highlighters are hands down the best way to read through a boring quickly and actually absorb it. They're also awesome for separating topics and drawing attention to key words in your notes. I tried to be like the cool kids, and use different colored marker-pens for different types of topics in my notes, but it is so much harder to remember to select the appropriate pen, than it is just to go back and swipe at your notes with different highlighters. Anything with color is a visual learners mecca. This Mac app must be fairly new, but it is AWESOME! I'm so glad I stumbled upon it. I dumped Wunderlist for it. 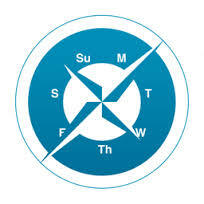 You can not only make to do lists for each class/portion of your life, but you can drag them right into a week view to schedule when you'd like to complete them. It is the most visually organized task manager I have ever seen. What's even more awesome is that it allows nested lists upon nested lists! Currently I have all my tasks for each class nested under their associated book chapter, and then I have each chapter nested under the exams that will cover them. DayMap is a life saver. 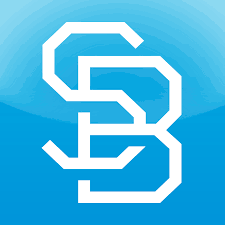 I have tested many a flash card app, and even in it's limited free version, Studyblue is the best for science majors. No other online flash card provider makes it so easy to type subscripts and superscripts, which you'll be doing an insane amount of in any of the sciences (especially chemistry). It also has the friendliest interface for adding images to your flash cards. When you flip through the flash cards, it gives you a percentage of correct answers, and the option to study your wrongs. It tracks your progress. Also, for bonus points, you can arrange your flash cards in a study guide that fills out a whole page for quick review. 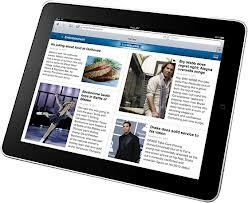 The smartphone app also gives you some leeway for last minute studying while you race to your class on foot. Studyblue may be the best if you've got time to make your own flash cards and study them, but if you're in a bind and just need to cram the material last minute, I would recomment Quizlet. Studyblue requires you to have a paid membership to access flash cards that others have created, but Quizlet does not. You can quickly search for your textbook and more often than not, someone has created a little test from it in the chapter you need. 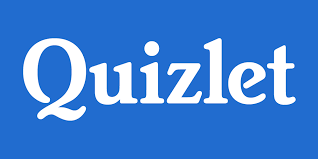 Quizlet also presents things in more of a multiple choice quiz format, which makes it ideal for last minute test review. 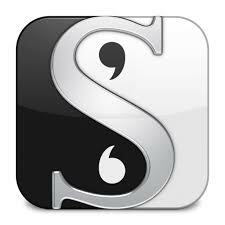 Scrivener is a writing app, but unlike word processors, it is laid out in a way that organizes your words, thoughts and information rather than writing things beginning to end. With it's preexisting layouts, it is an absolute godsend for writing research papers. It's perfect for creating a list of references, or organizing sections of your paper. It will instantly cure any hesitation or writers block you might encounter. If you're allowed a graphing calculator on your tests, you'll find it handy to program your calculator to run simple equations. I can't reccommend learning to program your calculator enough. Not only does it speed up simple formulas and steps to math problems, in the process of learning how to program, and testing your program through trial and error, you will actually learn more about how the equation works and are more likely to memorize the formula. It's a win-win situation. Plus some basic programming knowledge will benefit you in any science career someday. This is still a gold standard for digital note taking and organizing your notes. I mostly use it for taking random notes when I don't have a pen and paper, and then organizing them later. However, if digital notes are your game, this is simply the best. You can make list, organize with tags or "notebooks" and even record audio or upload images. 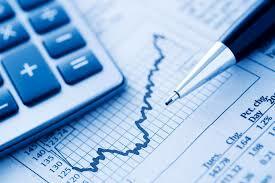 Plus it's free and any note you put on it, is automatically backed up online. 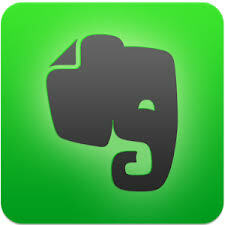 Evernote has apps for phones and desktops. A tablet is a great tool, whether you're second guessing your professor and want to double check some facts online, or etextbooks are your game, this guy does it all. You can even download the evernote app to it and take some notes during class. 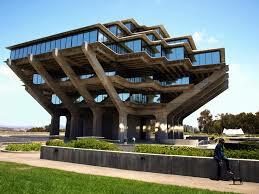 It's lighter than a textbook, and does just about everything. It's a lifesaver in moments when you forgot to bring your paper to class, but backed the file up to a cloud and are able to email the paper to your professor on the spot. It's not awesome for your eyes, but it's a lot better than the tiny screen of a phone. The most important tool on this list is just something to write with, like the marker-pen. Not to sound cliche, but a set of tools are only as powerful as the user. That being said, any one of these tools can make the life of a power user (a.k.a. you) so much easier.